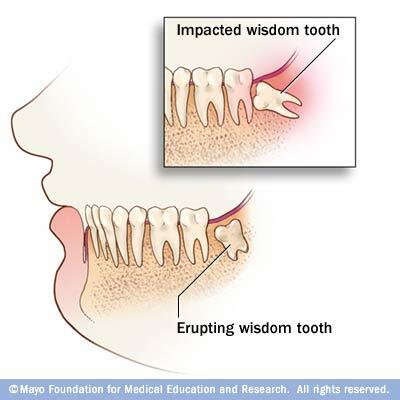 Wisdom teeth are the third and final set of molars that most people get in their late teens or early twenties. Sometimes these teeth can be valuable assets to the mouth when healthy and properly aligned but more often are misaligned. When wisdom teeth are misaligned, they may position themselves horizontally, be angled toward or away from the second molars, or be angled inward or outward. Poor alignment of wisdom teeth can crowd or damage adjacent teeth and also cause damage to the jawbone or nerves. 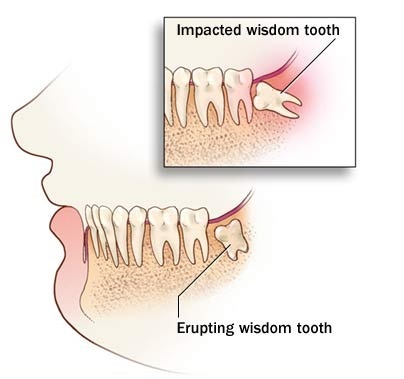 Wisdom teeth can also be impacted, meaning they are enclosed within the soft tissue and/or jawbone or only partially break through or erupt through the gum. Partial eruption of wisdom teeth allows for bacteria to enter into the openings around the tooth and cause an infection resulting in pain, swelling, jaw stiffness, and general illness. Removal of wisdom teeth is usually the best option and we make it easy to get them out by offering IV sedation with removal (see section on sedation for more information). Our trained doctor typically has all wisdom teeth removed within an hour. Many patients are back to their normal routines within a day or two of the procedure. The optimum age to have your wisdom teeth removed is teenage years to early twenties but it’s never too late to have them removed. Wisdom teeth are not the only teeth that sometimes need to be extracted. Keeping your natural teeth is always the best option, however, if a tooth is not able to be saved due to decay, infection, or other problems it will need to be extracted. We are able to extract any tooth and also offer many options for replacing lost teeth.